Beyoncé and hubby JAY-Z may not have nabbed any awards at the 60th Grammy Awards last night (January 28), but the pair certainly haven't lost their knack for head-turning public appearances. 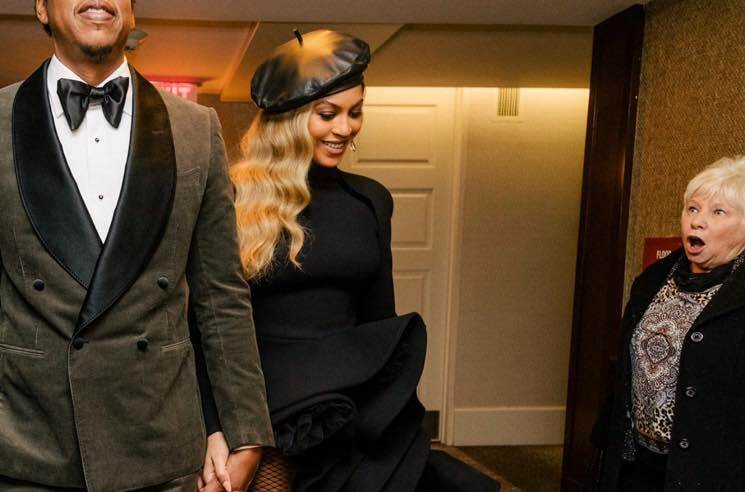 Queen Bey shared a string of photos from "music's biggest night" on Instagram, and while there's plenty to be admired about the couple's fashionable threads, it's the reaction of an innocent passer-by captured on film that has slayed the internet. An older woman can be spotted in the corner of one of the photos, a look of pure shock and awe plastered to her face. No one can blame her, given the talent walking by, but that hasn't stopped the woman from becoming an overnight meme sensation. See some of the best reactions to the candid shot below. It's hardly the only meme-able moment that the Carter-Knowles delivered over the course of the Grammys, though. See a few more below.